With an abundance of uses in the kitchen and office, these mesh storage baskets add instant storage for frequently needed items to refrigerators, desks, or any magnetic surfaces. The small bin is ideal for everything from herbs and spices to pens and markers, and can also be used to hold cards, labels, and other small items. Provide a place for small items where they're needed most, and make the kitchen or office run more efficiently with these convenient magnetic storage baskets. NO-INSTALL CONVENIENCE: Magnets allow easy mounting to refrigerators, metal cabinets, desks, or any flat magnetic surface. 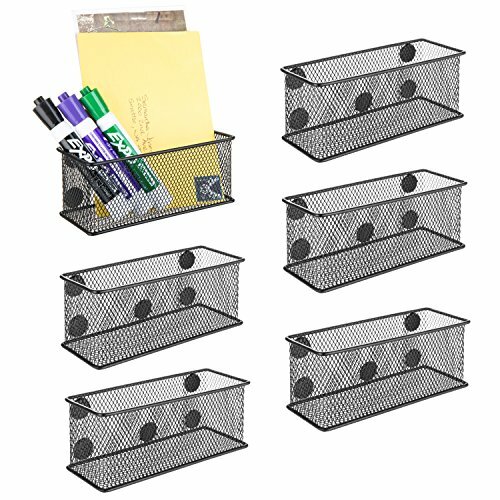 REMOVABLE & REUSABLE: magnetic baskets can be easily moved and used in different locations.